← antifa notes (september 28, 2018) : Anning, Coulter, Fortress, Palmer, Yaxley-Lennon, Yiannopoulos et. al. Blink and you might have missed it, but Saturday, October 6 was ‘International Freedom of Speech Day’, with ‘International’ having the operative meaning of ‘Wiley Park in Sydney and Docklands in Melbourne’ and ‘Freedom of Speech’ ‘whining about Facebook and the Racial & Religious Tolerance Act‘. Organised by Adelaide-based law-talking guy John Bolton, two months of solid promotion on social media yielded … well, not a lot, really. 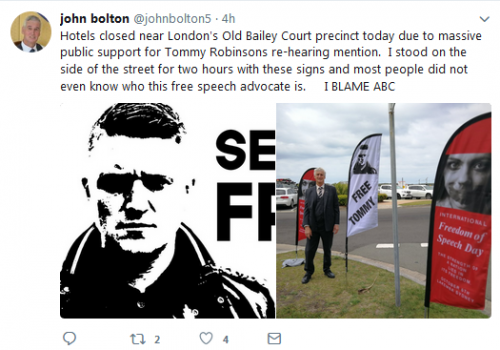 Thus, maybe 30 or so patriotik Volk joined John at Wiley Park, where they listened to him whine alongside his neo-Nazi client Blair Cottrell and er, Nick Folkes (ex-Party for Freedom). Included in the audience was ‘Mark McDonald’/’Tyler Winchester’, formerly of ‘Squadron 88’ but now of the Sydney franchise of ‘The Lads Society’, NSW True Blue Crew lvl boss ‘Mitch(ell) van Dam’, and various members of both grouplets (Dwayne Bullen, Max Towns), former Reclaimers and Peanuts — even Rino ‘Bluebeard’ Grgurovic put in an appearance. In Melbourne, the very smol rally was organised, appropriately enough, by ‘Tiny’ Avi Yemini. On stage he was joined by Fraser ‘Final Solution’ Anning and ‘Australian Liberty Alliance’ boss and wealthy gadabout, the Perth-based Debbie Robinson. As usual, Daniel Jones and George Jameson played dress-ups, some other pretend ‘Soldiers’ (of Odin) were present, but most in the crowd of perhaps 50 seemed to be drawn from Tiny’s facebook klvt and/or were elderly racists. The only interesting moment, of course, was when a deadset legend exercised his Freeze Peach by asking Anning if the allegation that he’s a ‘massive f*cking c*nt’ is correct, to which the whiny manbabies naturally responded by screaming for the police to silence Our Hero. As for Bolton, he spoke at the Reclaim Australia rally in Adelaide in November 2015, a PEGIDA rally in Canberra in February 2016, an anti-refugee protest in Eltham in November 2016 and the final. ever. Reclaim rally in Sydney in January 2017. After being dropped by the ALA, Bolton ran as an Independent for the seat of Wakefield at the 2016 federal election and placed 6th of 7 candidates with 2,728 votes (2.84%). More recently, Bolton joined a handful of Peanuts in Sydney in September last year to proclaim ‘Straight Lives Matter’ and in June this year expressed his support for poor old Sonia Kruger (see : How An Australian Television Host Became The Latest Free Speech Hero Of The Far-Right, Brad Esposito & Lane Sainty, Buzzfeed, June 25, 2018). But while Bolton obviously enjoys the company of racists and fascists, his chief point of interest is, I suppose, his legal work on behalf of Melbourne-based neo-Nazi Blair Cottrell: apparently, Bolton is mos def gonna win in the High Court, and have Cottrell’s criminal conviction for arson drug trafficking inciting hatred for Muslims struck out because the Racial & Religious Tolerance Act‘ is like, totes un-Constitutional. This entry was posted in Anti-fascism, State / Politics and tagged Australian Liberty Alliance, Avi Yeminem, Avi Yemini, Blair Cottrell, Daniel Jones, Debbie Robinson, Dwayne Bullen, Fraser 'Final Solution' Anning, Fraser Anning, George Jameson, John Bolton, Lads Society, Mark McDonald, Max Towns, Mitch Van Dam, Mitchell Van Dam, neo-Nazi, Nicholas Folkes, Nicholas Hunter Folkes, Nick Folkes, Rino 'Bluebeard' Grgurovic, Rino Grgurovic, Soldiers Of Odin, Squadron 88, The Lads Society, Tiny Avi, True Blue Crew, True Blue Crew (NSW), Tyler Winchester, Wiley Park. Bookmark the permalink. Thank you for the plug. I appreciate your support. I do agree that the turnout was piss poor. The left do a much better job at organising the troops and keeping them active in politics and propaganda. Despite the odds, I still enjoying travelling to Wiley Park as I was able to touch base with quite a few friends. Tomorrow belongs to us!